Mitt Romney escalated the pressure for Donald Trump to release his tax returns, doubling down on his belief that the presumptive Republican nominee has something to hide. “Your imagination can run wild,” Romney said in an interview with CNN’s Wolf Blitzer on Friday. Romney is just one of a growing number of voices calling on Trump to make his tax returns public, a tradition observed by major-party presidential candidates since the early 1970s. Trump has resisted the call thus far, and Romney said “there is no question” that Trump will never come around. 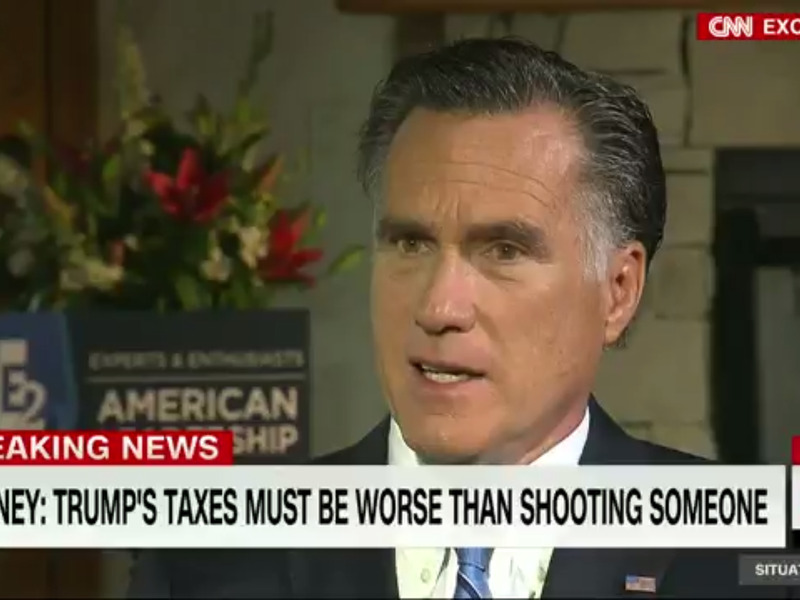 “There’s something in those taxes that’s even worse than shooting someone on Fifth Avenue,” Romney said, referencing a joke Trump made during his primary campaign that he could shoot somebody in the middle of the street and not lose the backing of his supporters. Trump has cited an ongoing IRS audit as the reason why he has not made his tax returns public.